1.02m, 0.88kg, Overall Length 41". 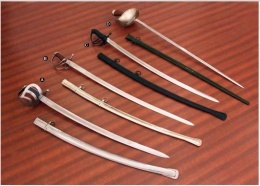 A.Dutch Cavalry Sword : slightly curved steel blade, steel basket hilt, black leather and wire wrapped grip with brass details, steel sheath with mounting ring and tip detailing. B.British Light Cavalry Sword: Full tang, tempered, high carbon steel, saber style blade, Wire wrapped Wood Grip, Steel basket hilt, Steel Scabbard, 1.02m, 0.88kg, Overall Length 41". B.British Light Cavalry Sword - European examples of light cavalry included stradiots, hobelars, hussars, chasseurs à cheval, cossacks, chevau-légers and some dragoons. This page was last modified on 11 September 2014, at 22:01.